Great news; Add-Art, the Firefox browser extension that replaces ads with art is now Firefox 3 compatible. The extension blocks advertising and replaces it with art images that change every two weeks. The art comes from contemporary artists and curators – read a review from Rhizome. If you’ve been waiting for Add-Art to work in Firefox 3, now is the time to update. Add-Art is a free Firefox add-on which replaces advertising on websites with curated art images. Created with the support of Eyebeam, Rhizome, Add-Art releases new art shows every two weeks and strives to feature contemporary artists and curators. The plugin works alongside AdBlock Plus, which blocks online ads, and simply replaces that blank space with art images. AdBlock Plus is the most popular of the thousands of available add-ons for Firefox with 18 million total downloads (as of May 2008) and over 250,000 downloads last week. 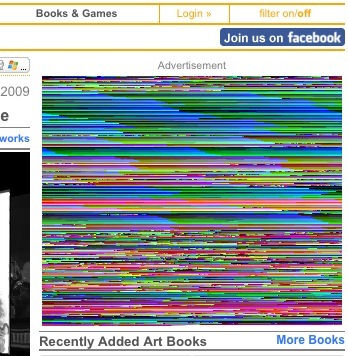 Would you like to see art instead of ads as you browse sites online? Go to add-art.org and download the plugin for your Firefox browser now. To discuss it further post in the add-art forums. 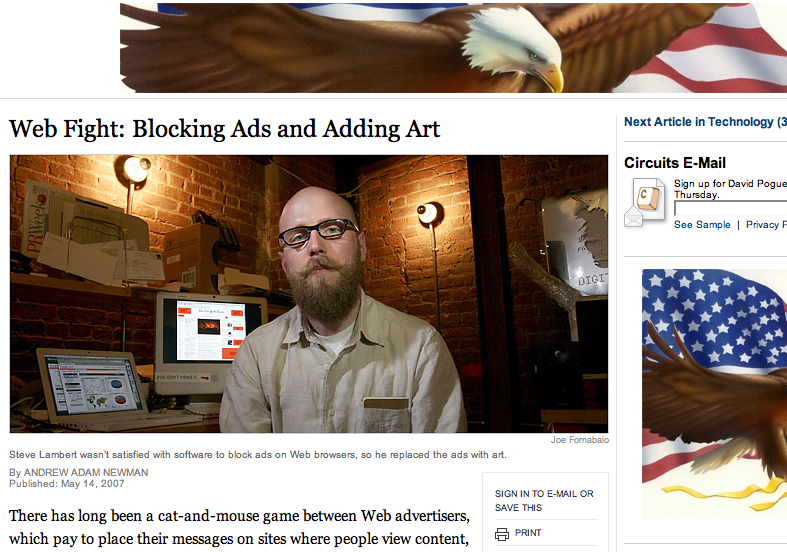 AddArt, a browser plugin I’m developing at Eyebeam was written about in the New York Times today. AddArt is an extension for the Firefox browser which removes advertising and replaces it with art. The project is being developed and I’m looking for funding to pay coders as well as provide stipends to artists and curators. If you’d like to make a tax deductible donation, let me know.